Four old schoolmates, Art, Fabio, Tony, and Mauro have a pact: to meet up every year in the small town in Southern Italy. Art, the enigmatic leader of the group and creator of the pact, has always been adamant that the promise must remain constant and permanent. For 17 years this agreement has been kept but this year, Art fails to show up, vanishing without a trace, something that’s happened once before many years ago when the friends were teenagers. Searching for him, the friends come to grips with their own past and make a disturbing discovery. Art has been farming marijuana, a very dangerous activity in mafia-controlled country. Asking around town, they hear bizarre and farfetched reports that Art has miraculously cured a local mob boss’s young daughter of terminal cancer. 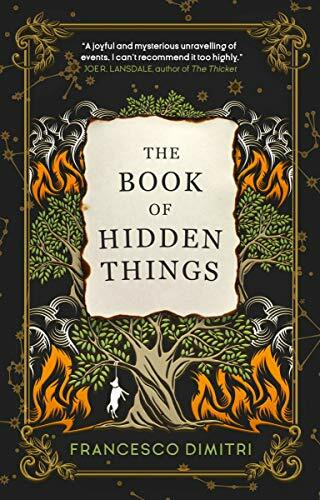 Amid the confusion of this discovery, the friends find a mysterious manuscript written by Art entitled The Book of Hidden Things: A Field Guide, which promises to reveal dark secrets from the past and wonders beyond anyone’s wildest imagination. Through these writings, Art’s friends hope to discover what has happened to their friend. The Book of Hidden Things is Francesco Dimitri’s English language debut. Considered one of Italy’s foremost fantasy novelists, Dimitri has authored numerous works that include La Ragazza dei miei Sogni. In this thrilling new novel, he alternates the storyline between each of the friends. This presents the reader with unique perspectives on how each of them thinks about the past and the present. We learn that each of Art’s friends is secretly struggling to escape from some kind of inner turmoil and the mysterious book they discover claims to hold the secret answers to the realm of resolution and happiness. As the friends struggle to confront their personal demons, each must decide if the rewards are worth the pain. At first glance, the premise of this novel looks to be rather random with its mish-mashed plotline of detective mystery, crime drama, supernatural thriller, and self-help. But initial impressions can be deceiving and what promised to be a hot mess of randomness ends up working and working well. Beautifully written, Dimitri has produced an enlightening and thrilling story that succeeds at every turn. His insightful observations of how our early memories and interpersonal relationships help shape our adult lives is remarkably poignant. The Book of Hidden Things is an absorbing story that defines how we look at home. It’s a story filled with twists and turns that will most certainly entertain, terrify, and captivate readers.